Brad Smith unpacks how Microsoft's AI for Accessibility program is putting AI tools in the hands of developers to accelerate the development of accessible and intelligent AI solutions for people with disabilities around the world. 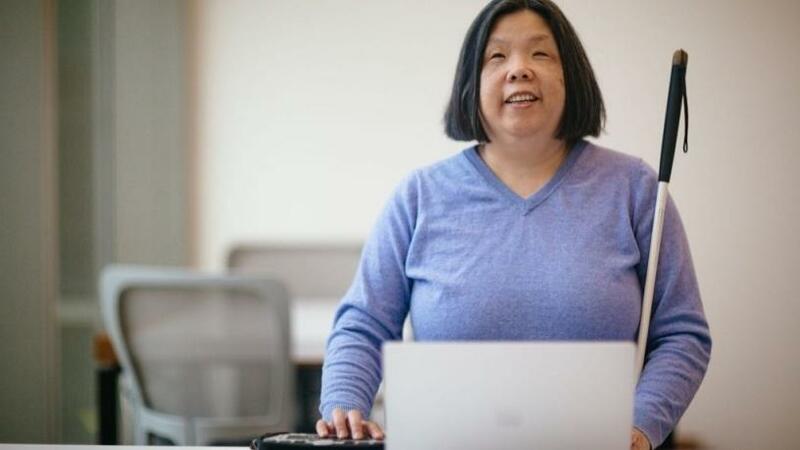 Anne Taylor works on the Microsoft Accessibility team, which strives to make products and services accessible for all customers. Microsoft's $25 million, five-year programme called 'AI for Accessibility' is going to assist in the development of technological solutions that will benefit a billion or more people with disabilities around the world. This was revealed in a blog titled: "Using AI to empower people with disabilities" written by Brad Smith, Microsoft's president and chief legal officer. He adds that AI can be a game-changer for people with disabilities. "Already we're witnessing this as people with disabilities expand their use of computers to hear, see and reason with impressive accuracy. At Microsoft, we've been putting to work stronger solutions such as real-time speech-to-text transcription, visual recognition services, and predictive text functionality." Smith highlights the fact that AI offers enormous potential by enabling people with vision, hearing, cognitive, learning, mobility disabilities, as well as mental health conditions, to do more in three specific scenarios: employment, modern life and human connection. The programme will be run by Microsoft's Accessibility team and its chief accessibility officer, Jenny Lay-Flurrie. The team will be building on its success over the past three years with developers and engineers across Microsoft, and their expanded mission is to provide a new level of tools and support for developers and around the world. * It will provide seed grants of technology to developers, universities, non-governmental organisations and inventors, taking an AI-first approach focused on creating solutions that will create new opportunities and assist people with disabilities with work, life and human connections. * It will identify the projects that show the most promise, and make larger investments of technology and access to Microsoft AI experts, to help bring them to scale. * It will infuse AI and inclusive design across Microsoft's offerings, and the company will work with its partners to incorporate AI innovations into platform-level services to empower others to maximise the accessibility of their offerings. To date, Microsoft Translator is empowering people who are deaf or hard of hearing with real-time captioning of conversations. "Helpicto, an application that turns voice commands into images, is enabling children in France with autism to better understand situations and communicate with others. Finally, Seeing AI and auto alt-text features are helping narrate the world for people who are blind or have low vision."